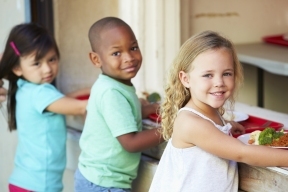 In June 2010, the Greater Chicago Food Depository launched a mobile meal program to distribute nutritious lunches to children under 18 in priority communities in Cook County during the summer months. The Lunch Bus travels to 24 sites on four routes throughout Chicago and the South Suburbs. The Lunch Bus Serves 5,000 meals every week and makes daily stops to South Lawndale and Cicero every weekday. The Food Depository’s summer hunger initiatives provide meals to children in Cook County who might normally receive free or reduced-price lunches during the school year, but no longer have access to those meals in the summer. These initiatives include the Lunch Bus mobile meal program, free Kids Cafe meals at summer programs across Cook County, and free lunches at designated Chicago libraries. The Greater Chicago Food Depository serves 232,100 households per year (812,000 individuals,) with 39 percent of those households having at least one child under the age of 18. For information on the Lunch Bus’ routes, visit http://www.chicagosfoodbank.org/site/PageNavigator/2016LunchBus.html.